The Australian culture is one of the oldest cultures on the planet. 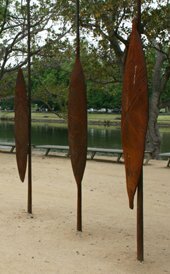 Its Aboriginal heritage, the pioneer bush culture and multicultural influences have shaped the happy-go-lucky resourcefulness of the Australian character. Warning: This section may contain links to sites that may use images of Aboriginal and Islander people now deceased. The Australian Aboriginal culture goes back at least 50,000 years. It is the oldest living culture in the world. The secret to its long survival is their affinity with the land. The Land is sacred to Aboriginal people. They live off it and use it, but also preserve it. Traditionally they have been hunters and gatherers, with exceptional abilities in tracking down animals, identifying and locating edible plants, and finding sources of water and fish. Indigenous Australian culture has been passed from one generation to the next, including sacred knowledge of Aboriginal law, arts, rituals and performances, languages and sacred sites. Their spirituality is that of Aboriginal Dreaming , stories of Ancestor spirits coming to the earth, creating animals, plants, rocks and other land forms. These spirits then changed into trees, stars, rocks, watering holes or other objects themselves, which then became the sacred sites of Aboriginal culture. Australian Indigenous art you can buy today reflects the richness of this culture. Bush in the Australian language is not a bush but refers to the natural environment. It has an iconic status and shaped Australian identity. It features strongly in its literature, painting, popular music and films, and was romanticized by writers such as Henry Lawson and Banjo Patterson. From the 1790s bush ranging, living off the land, and droving, the practice of moving livestock over large distances, was often the preferred option compared to the harsh convict realities. White Australia had begun as a prison island for the English. Bush ranging came to an end with famous rebel Ned Kelly in the 1880s, when outlawed bushrangers could be shot and sent to trial. 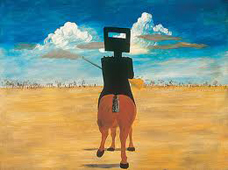 Ned Kelly has become one of Australia's greatest folk heroes, with his story rendered by painters, writers, musicians and filmmakers alike. Australian culture has elements that can be traced back to both the convict past and the rebelliousness of the bush rangers: The tall poppy syndrome, a tendency to cut down outstanding achievers may have come to an end in this 21st century; and the rebelliousness of Australians that tend to do the opposite to what they are told to do. During the gold rush Australia had quickly become rich. Many Australians had moved to the cities that buzzed with commerce and new opportunities. However, these cities were also subject to the boom and busts cycles of modern life. During the hard times after the 1890s financial downturn, stories of the bush and goldfield legends were idealised as a symbol of national identity. 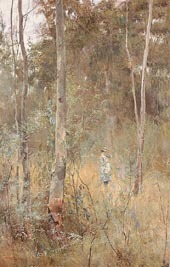 The Australian bush became the subject of the painters of the Heidelberg School in the late 1890. In the 1940s the Angry Penguins, painters like Arthur Boyd and Sidney Nolan, continued the bush theme with their spontaneous visionary approach. Today, many urban Australians speak romantically about going bush. Bush camping and getting away from it all is how many families spend their holidays. Modern Australia is a country of immigration. From the English and Chinese to the Germans, Italians, Greeks, Vietnamese, people from the Middle East and lately Africa, each of these cultures have brought aspects of their society to Australia. In Melbourne Australia you find China Town, Italian suburbs, Greek quarters, and many areas where certain cultures dominate. There are over 100 languages spoken in Australia and more than 1/3 of all residents were born overseas. This has created a colourful tapestry of art, events, celebrations and cuisine. You can find many small restaurants with great food from almost any part of the world. This mix of nationalities, the sunny weather and endless beaches have created the typical 'happy go lucky' Aussie culture. Ready more about this type of Australian Culture here.